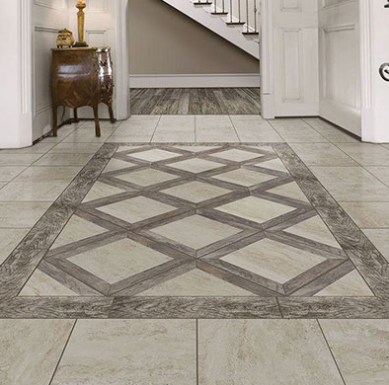 Natural stone flooring gives us the aesthetic appeal that we crave in our homes! It can last a lifetime when given the proper treatment and care, and there are definitely things we have to watch out for. Below, you’ll find a list of Do’s and Don’t’s for caring for your natural stone flooring, and we hope this basic guide is helpful! Follow these guidelines and you’ll be good to go! One of the most common questions regarding sealing tile and natural stone is “Do we need it?” Yes, absolutely! Do seal your natural stone flooring upon installation. Furthermore, check with the manufacturer to see when the sealant should be refreshed. Do vacuum or sweep on a regular basis to remove abrasive materials like dirt and sand from the flooring. It’ll save you a lot of trouble in the long run, and help maintain that flawless appearance your flooring had upon installation. Don’t use abrasive cleaning tools to remove dirt and grime from your natural stone flooring. Abrasive cleaning tools could be steel wool, microfiber scrub pads, or scrapers. Avoid all of these entirely! Don’t use ammonia-based cleaners. They’re dangerous to the flooring’s surface; we certainly don’t want any harm done while cleaning! Don’t use cleaning products that contain lemon juice, or vinegar. They tend to dull the surface of your natural stone flooring! We get it- life is busy, and it can be difficult to not only keep up a regular cleaning routine, but also to clean our flooring properly. That’s where The Steam Team comes in. We have over a decade of experience caring for not only natural stone flooring but also tile and grout, carpeting, hardwood flooring and more! No task is too complicated or too daunting for The Steam Team. Give us a call today. No matter what type of flooring you have, it’s inevitable that it will wear over time. All floors show their wear differently, though, so it’s important to know how you can prevent damage and when it’s time to call in the professionals. We’ve put together some tips to help you care for your floors effectively and efficiently! Voted best carpet cleaning in Austin, Texas. When debris is tracked into the house, it can get stuck in carpet, cause scratches on tile, grout, or even hardwoods. If you have a porch, that can be a great spot to stick shoes before walking in the house, or you could simply set down a mat near the door for guests and family members to place their shoes. Don’t forget about area rugs! They’re great for protecting your flooring and being a beautiful accent piece in your home. Now that you’re keeping majority of the dirt and grime out of your house by removing shoes and asking guests to do the same, the second-biggest thing to consider when it comes to protecting your flooring is your pets! Not only will they track in extra grime from the outdoors, their nails can also cause a lot of damage to flooring if they’re not regularly trimmed. The last thing that causes concern when it comes to flooring is furniture. It’s best to use protective pads for furniture that’s frequently used, like office chairs or even dining room chairs, but be careful moving anything around. Depending on the type of furniture and how heavy it is, you may want to have professionals move and place your furniture to best protect your flooring. Don’t forget about regular maintenance for all flooring! Give us a call at The Steam Team to learn about taking care of your flooring or for help cleaning your flooring, furniture, and more!